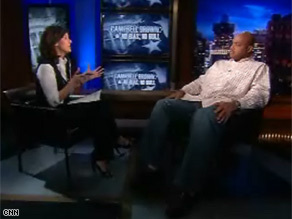 Barkley says he supports Barack Obama, "a wonderful person"
Charles Barkley tells Campbell Brown some whites will vote for Obama, but tell their friends they didn't. Campbell Brown: To start off, let's talk about something that has been getting a lot of attention, which is the Bradley effect. You know, the idea that the polls don't tell us the truth about this election and that people will say I am willing to vote for a black man but they go into the booth and they won't. They are telling pollsters one thing and doing something else. Do you thinks that's real? Do you think that is going to be an issue? Charles Barkley: Of course that's real. I think if you ask... first of all, racism is the greatest cancer of my lifetime. I think anybody who is racist is an idiot whether they are black or white. Anybody who is racist I just I think they are an idiot. But if you ask any white person on television, they are not going to say I'm not going to -- well, actually, some people have said they are not going to ever vote for a black guy, but quietly. There are some people who say yes, [who] come on television and say they would vote for a black guy who are not going to vote -- they are going to vote for [Republican presidential candidate Sen.] John McCain. Barkley: I think the polls are absolutely useless. I do. Seriously. Most people who are racist, they are not going to answer that question correctly either on the phone call or on camera, so I 100 percent believe the polls are flat out useless. I think this race is going to be neck and neck down to the wire. I also think there is a reverse thing. I think there are some white people who say [they] are gonna vote for [Democratic presidential candidate Sen.] Barack [Obama] because he is going to be better for their financial situation. So I think the Bradley factor is a bigger factor, but I do think that there are some white people who say they are not going to vote for a black person around their friends, but when they get in the booth they are going to vote for him because it is going to be better for their economic situation. Brown: If he does go on, if Barack Obama does pull this off, tell me what it will mean for African-Americans? Barkley: Well, It would be great for -- it would just be great that white America elected a black president. Because the truth of the matter is, unless he gets a certain percentage of the white vote, he is not going to be elected, so that would be cool that white people had enough confidence in him. But Campbell, unless we, we as black people stop killing each other, not getting our education, we have to do better. Racism does exist. It is always going to exist, but until we as a people stop killing each other and stop not getting our education we are never going to be successful. I mean, because realistically, whoever the president is doesn't have a huge effect on anybody's life, to be honest with you. Brown: You really believe that? Brown: He is the most powerful man in the free world? Barkley: But he doesn't have an effect on people's everyday lives. He does not. I mean, think -- it's not -- I mean that sincerely. Whoever the president is does not have an effect upon people's everyday life. Brown: So you see him more as a role model? Barkley: I see him as a great role model 'cause we got to get more black kids educated. And you know we have this terrible thing going on in the black community about if a black kid does well in school we make fun of him. We've got to get more black kids getting their education, carrying themselves with great dignity, and self esteem. I've always looked at this as bigger picture. I mean, because if he wins, it ain't like -- really, I think he's just a great role model for young black kids. I don't mean that in a negative as far as, like, who the president is is really not going to have a huge effect on people's everyday life. Brown: What about the counter to that? If he doesn't win this election, ultimately, how much of a disappointment is that for African-Americans in this country in your view? Barkley: I think it will be a great -- first of all, I never thought in my lifetime I would see a black president. Barkley: I did not. And I'm surprised, happily surprised he got this far. It would be very disappointing, but, listen, we're in terrible economic situation. And first of all whoever's president, the next four years is gonna be a really difficult time and a really difficult situation. You know they're shipping all our jobs overseas, the public school system is in disarray, they're spending $10 billion a month in Iraq. Whoever the president is, it's gonna be really rough for the next four years. Brown: Uh, do you think...do you think that John McCain, do you think the Republican Party has used race as an issue in this race? Barkley: Oh, no question, and they've used cold words like welfare and things like that. When people pick on welfare, first of all when they use the word welfare, that is really swaying, trying to use that as a minority thing, because people assume -- if they really knew anything about the numbers. There seven times as many white people on welfare as black. Because there's more white people in America. But when I see a story on welfare on television, they only show black people. But most white people don't know that sometimes there's as many whites on welfare as black people. And they just use cold words, they use the terrorist thing now. You know, they try to use the Muslims thing. Those are racial innuendos, of course, and I've said it from the beginning, the only way with the economy in the situation it is -- we've had eight terrible years under the Bush's administration, with the war in Iraq -- I've said it from the beginning. The only way they can win this election is make it about race. That's the only way they can win. I wrote a chapter in one of my books about what happens in a race, when things are going bad, everybody kind of goes with their own tribe and the only way the Republican party can make this thing work is they get their tribe to get together and of course they use racial innuendo. Brown: Has his campaign changed your view at all, given the way it has gone, given what you have said? Brown: But he's the head of the Republican Party. Barkley: I know that, but this thing didn't start with him. It started with President Bush and these gifts to rich people like myself -- all these tax cuts and things like that. That's my biggest problem. Uh listen, John McCain, you gotta respect anybody who goes to war. But these Republicans who ran this economy into the ground. We've got to end the war in Iraq and we got to stop giving rich people like myself and people who run big companies tax breaks. We've got to do that. Brown: You, there has been a lot of polarizing rhetoric on both sides, frankly throughout this campaign. You yourself have called the evangelical base of the GOP fake Christians. Barkley: Well, because they are so judgmental. And you know what is really interesting about that? I was actually defending John McCain when I said that, because they were saying when he first got nominated that he is not part of the evangelicals. You got to respect Sen. McCain. What I meant by that and I still stick by it -- my idea of religion is we are supposed to encourage people to love other people. I am a big pro-choice guy. I am a big gay marriage guy and they are so divisive and that is not my idea of religion. My idea of religion is we are supposed to bring people together. We are not supposed to judge other people. Brown: But aren't you judging them? Barkley: They judge me. First of all the notion that you would vote for a president because he is against abortion or against gay marriage is absurd. I think politicians have three jobs. No. 1 they should fix our public school system, they should make sure our neighborhoods are safe and they should give people economic opportunity. I don't care who is gay, I don't care who is pro-choice. I really think that is the only three jobs that our government and our elected officials should have and we obviously got to do something about the health care and this situation. But to elect a president and vote for a president just because he is against abortion and against gay marriage is absurd. Brown: [Republican vice presidential candidate Alaska Gov.] Sarah Palin has gotten an enormous amount of attention in this campaign. What do you think about her? Barkley: I think they did a great disservice because they never let her speak. They are trying to do it now, but they did her a great disservice. Yes, I think he selected her to try to get the Hillary Clinton vote and I don't know that much about her because they never let her talk and when they do let her talk they let her talk to a fan friendly audience. So you can snip it how you want to. So, I haven't seen enough and they haven't let her do enough for me to really form an opinion, but I do think they selected her just to get the Hillary Clinton vote. Brown: Talk to me a little bit about your own political aspirations. You said in the past that you want to go back to Alabama. That is home for you. Barkley: Alabama needs a lot of help. You know Campbell, the reason I have become really pro-active -- and to be honest with you I never really got involved with politics until John Kerry and John Edwards last time. And the reason I'm supporting the Democratic Party [is] no more than I like Barack. I think he is a friend of mine. I think he is a wonderful, wonderful person. The reason I voted for John Kerry last time and have been more out there this time, I look at the -- it's really about rich people versus poor people and I think it is a travesty what they have done to poor people in this country. And lets be realistic, it doesn't, George Bush -- I don't care. It's not going to have any effect realistically on my life who the president is. The reason I am supporting the Democratic Party, I think it is a bona fide tragedy what has happened to poor people in this country and the gap between the rich and the poor is wider than it has ever been. You got this bailout situation, I just think it's a travesty. Brown: And the top priority for you would be education? Barkley: All the way education, the public school system in this country is the worst it has ever been and what that does is that hurts crime, it hurts the judicial system. You know if you don't give people education and hope, they become criminals. They get involved in drugs. So we have got to fix the public school system. I think we need to make these neighborhoods safer. And the third thing, you have got to give people economic opportunity. America for far too long has a small group of people who have got all the money and then we got a bunch of poor people who have no money. And because we have killed the public school system they can't get the education to make money and that is just not right. Brown: Charles Barkley, good to see you, appreciate it, good luck to you. Barkley: Thank you very much, thanks for having me.